Summer is getting closer and the days are getting longer. It’s time to enjoy the rays of the sun properly on the beach. Best to do that in a bikini. 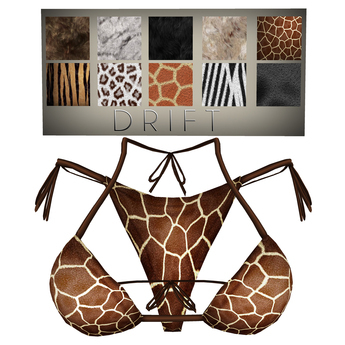 Today we present the mesh bikini set “Wildlife Set Collection w/HUD” from DRIFT. The mesh is well made and the HUD gives 10 different wildlife patterns to choose from to individualize your own exotic look. Of course the bikini can also be purchased with other patterns in more conservative looks. By the way – the set is really a steal deal for just 115 L$!